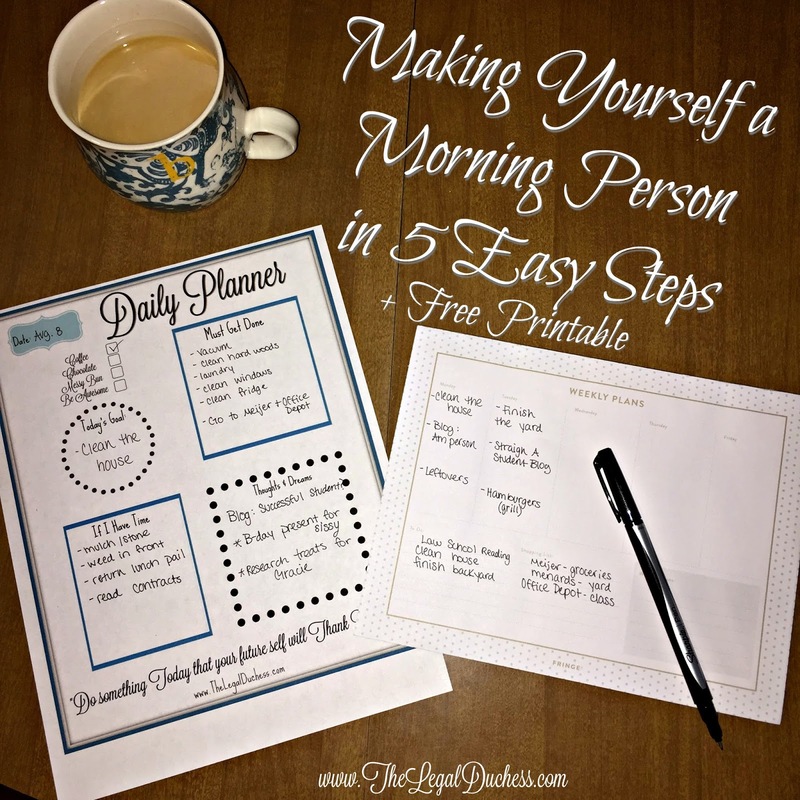 Making Yourself a Productive Morning Person in 5 Easy Steps + FreePrintable! Coming to you from my couch, snuggling with my golden pup and watching the Olympics in between (Go USA!!!). Call me crazy, but I actually love Mondays. It signals the start of a new week and a fresh start. I love starting my week off on the right foot and planning out a productive week. However, Monday mornings are the worst. After a weekend of sleeping in and relaxing with my hubby, Monday mornings just seem to hit like a freight train. I am not naturally a morning person; I prefer to be most productive at 11:00pm. Despite this, I have worked out a system that allows me to be a better morning person and to enjoy getting up before 9:00am as much as I can. 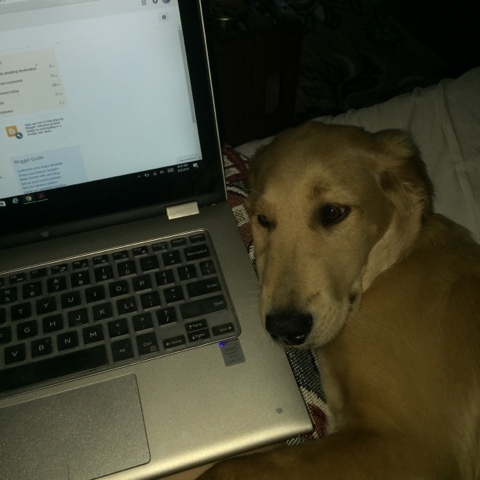 SO how do I do it without being a total grump? Here is my 5 steps to making yourself a productive morning person! I tend to be the queen of setting 500 alarms to ensure I get up in the morning. However, that also makes it really easy to turn one off and convince myself that the 10 extra minutes of sleep before the next one goes off will truly make the day great. I have started to force myself out of bed at the first alarm. Granted, my 3-month-old puppy has helped this habit because she is wide awake the minute any alarm goes off and does a pretty darn good job of getting me out of bed. Once you force your half-dead body from the warm sheets, make your bed. This not only starts the day out with a clean and productive beginning but it also discourages you from climbing back in and waiting on another alarm to go off. I try to get my bed made asap so that I cannot go back to sleep. Breakfast is something I always look forward to. It is my favorite meal of the day. Therefore, if I keep good breakfast food in the house, I am more tempted to get downstairs and make myself waffles instead of getting back in bed. My routine has come to include a hearty breakfast and the first cup of strong coffee while I watch one 30 minute episode of something on Netflix while still in my PJ's. I give myself this 30 minutes of vegging out, relaxing and fueling myself for the day. Some people prefer to hit the ground running in the morning; I need a little time to get alive before I can start to conquer the day. As long as you find something that works for you, a good breakfast routine will help your mornings immensely. Even if you are planning on staying in all day and studying or doing dirty yard work, get yourself dressed right from the get go. If I let myself stay in my PJ's past breakfast, it sets a lazy tone for my whole morning and therefore my whole day. I try to get dressed and ready immediately after breakfast. Once I have a fresh outfit on, my hair wrangled into a semblance of acceptability and at least some BB cream and mascara on, I feel ready to conquer the day and get to work. It signals the beginning of my "work" day to be dressed and ready for whatever that day might bring. This could be anywhere from a business suit for Law School to old painting clothes to repaint my deck. No matter what I am wearing, getting dressed to conquer that day is the signal I need to know it is time to get the day rolling! I love to write down everything. To-do lists, calendars, planners, meal planning; you name it and I probably have it written out somewhere around my house. Starting my morning off is no different. In order to start a productive and organized day, I have discovered that having a "daily planner" sheet is the best way to do this. I prefer to sit down at the table with cup of coffee #2 and this cute little daily planner and take 10 minutes to map out my day. I put down what I have to get done, what I want to get done, what my big goal of the day is and any other random thoughts that get running through my mind. Getting everything out on paper helps to clear my mind and create some order for the day and prioritizes what I have to do. Originally, I just jotted this all down on a small legal pad but eventually I made this cute little sheet to add some pretty functionality to my morning. 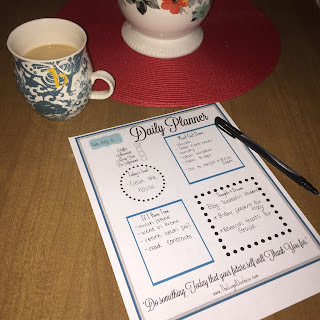 ***My Daily Planner sheet available as a free downloadable PDF printable for all of my lovely readers! I hope it helps to get your day started on the right foot just like it does for mine! 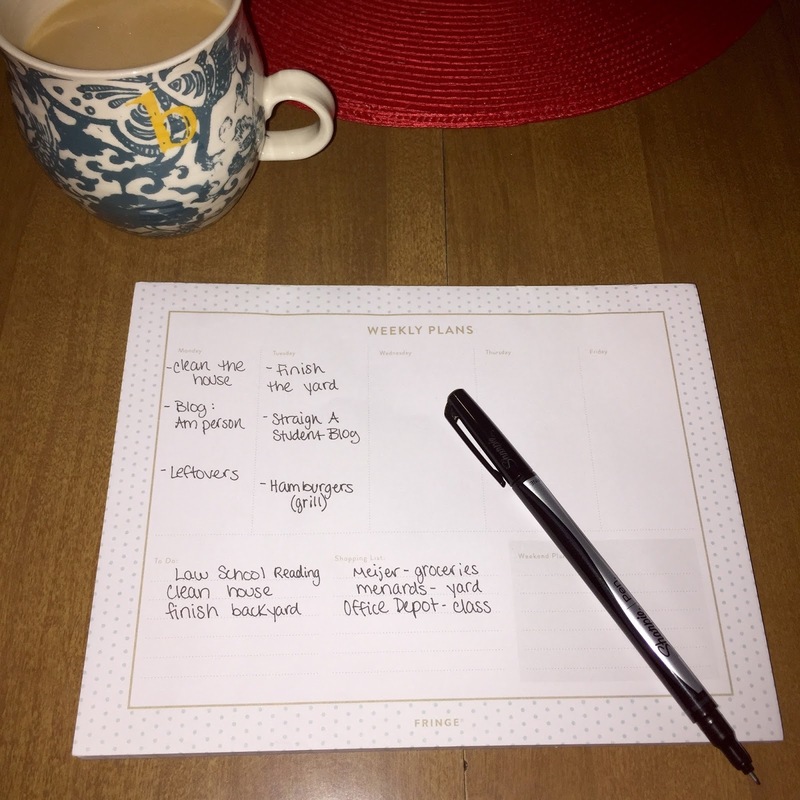 + My free bonus tip is specifically for Mondays: I love to fill out a weekly planner on Monday mornings laying out my goals for the week, meals, blogging, to-do list and shopping list. 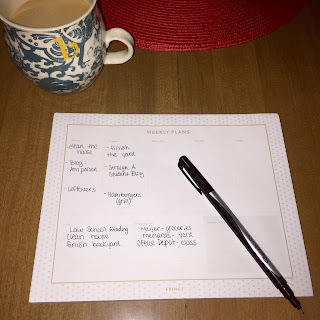 I find it so helpful to have a plan for the week before it gets started; it keeps me on track. 8:15am- Hit the ground running and get my day started! We are not all born morning people but hopefully this will help you learn to take advantage of mornings just as I have. Getting the day started early and started right is truly the best way to have a nice and productive day! Wishing productive mondays to all!